The Dell XPS 13 9370's screen is highly reflective. 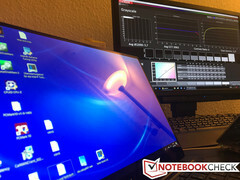 Lack of a matte display option was one of the pain points of the Dell XPS 13 9370, making it a tad difficult to use under direct light or outdoors. We had a chance to speak to some panel manufacturers during Computex 2018 and luckily, they tell us that the upcoming XPS 13 9380 will feature a matte display option. Also, based on the information thus far, we get to speculate that HDR panels are a likely possibility in the upcoming XPS lineup. The Dell XPS 13 9370 is a great choice for those seeking power and portability in a compact form factor but a major gripe of the latest generation has been that the display is a glossy panel with no matte option in sight. However, we had a chance to speak with industry insiders (read panel manufacturers) during the recently held Computex 2018 and we were glad to know that the upcoming XPS 13, the XPS 13 9380 or whatever Dell decides to call it, will indeed feature a matte display option. Unlike the last gen XPS 13 9360, the XPS 13 9370 drops the matte display option in favor of glossy panels in both the FHD and UHD variants. This makes using the XPS 13 9370 under direct light or in outdoors a somewhat unpleasant affair. Nevertheless, both the displays are indeed beautiful to look at and feature wide color gamuts and high brightness levels. As you can see from the display comparison above, the increased brightness and color gamut in the current generation comes at a cost of high response times. Also, as noted in our reviews of the XPS 13 9370, the reduced display lid thickness makes the whole display fragile and needs a glass cover to ensure rigidity. This could be the reason why there are no proper matte displays in this generation. Our conversations with panel manufacturers during Computex 2018 also lead us to speculate that we might start seeing HDR panels in the next generation XPS series. Back during CES 2018, we saw Lenovo introduce the ThinkPad X1 Carbon and the ThinkPad X1 Yoga with support for Dolby Vision HDR displays. Generally, most laptop displays are LCD panels with LED backlighting, which does not bode well for very high contrast or high luminance dynamic range. Although OLED panels are inherently capable of HDR, very few laptops such as the Alienware 13 R3 have actually adopted it. We, however, did not get any hints of OEMs switching en masse to OLED or HDR-enabled displays just yet. VESA has recently come out with a revised specification called DisplayHDR v1.0 that specifically addresses the needs of PCs and laptops incorporating LCD displays. Aside from mid-range (DisplayHDR 600) and high-end (DisplayHDR 1000) specs, the baseline DisplayHDR 400 comes with a minimum luminance requirement of 400 nits on a true 8-bit display, which is feasible in a laptop. On the software side, Windows 10 has gained better support for HDR with the April 2018 Update making it highly plausible that HDR on laptops is actually not too far off. We hope Dell does incorporate a matte display option and better response times in whatever panel it chooses for the next generation XPS 13. Although the HDR capability is still anyone's guess at this point, having the option will surely gratify the senses of potential buyers.